What was once a bogus rumor before will now come into reality as Jordan Brand announced the return of one of the famous editions of the Air Jordan5 Retro – the Air Jordan 5 “Grapes” edition. 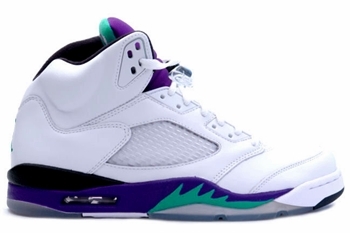 Last seen in 2006, this edition of the Air Jordan 5 Retro kick will be dropping in the market early next year sporting a much-improved look with its white upper part while the grape and green hints enhanced the overall makeup of the silhouette. This one has the potential of another it so make sure to watch out for it. We will be keeping you updated!